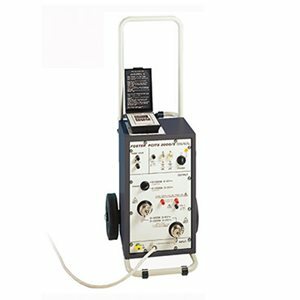 This Primary Current Injection Test Set is rugged, self-contained and designed for operation by one person. The PCITS2000/2 is a two-wheeled unit (with a handle). The test set has a separate hand-held controller connected by an expandable cable. This allows the operator to work close to a protective relay while controlling a test. The maximum output current is 2000 A a.c. at line frequency. By changing the range switch, half the rated output can be obtained at twice the voltage. Additionally, a separate auxiliary voltage output of 250 V, 2 A a.c. or 125 V, 2 A a.c. is available for testing voltage operated relay coils or checking the magnetisation characteristics of current transformers. All outputs are fully variable and each test set has a nominal duty cycle when delivering full current and voltage. Continuous operation is possible at 40% of maximum current.